A sign that the 80s revival is alive and well. At their best, Caligari channel elements of that decade's "paisley underground" (Dream Syndicate, Rain Parade) and other psychedelic pop revisionists (Plasticland, Green Pajamas) with alternately jangly/crunchy rhythm guitar, bouncy basslines, and anthemic choruses. "It's Out Of My Hands" excels by combining those sounds with tasty shifting synth drones combined with psychedelic guitar leads during the quieter sections. Elsewhere, the keyboards mostly accentuate the 80s vibe, and the Cure/Joy Division/Echo&the Bunnymen influences take over; on "Sense Departure" they're particularly blatant, but a hopped-up psych-surf midsection keeps things interesting. The title track is notable for its' Suicide (and Spacemen 3's take on that band!) influences in the repetitive metallic electronic percussion and keyboards, eventually breaking into more of a rock groove combined with further Joy Division-inspired vocals (yes, the lyrics speak of someone who's "lost control"). There's definitely some nice songs on this brief CD-R for those who like pure pop with a bit of extra sonic depth. 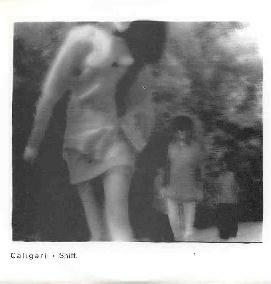 For more information you can visit the Caligari web site at: http://www.caligarimusic.com. Contact via snail mail c/o Signal 66 Records; 926 N. Street (Rear) NW; Washington, DC 20001.